If you want to use OneDrive in Windows 10 (as opposed to just playing with it in File Explorer), you need to crank up a browser. Any browser will do — Edge, Chrome, Firefox, even nasty ol’ Internet Explorer. At the time of this writing, the only way to get into many of these features is through a web browser. Microsoft swears it’s going to build access to all this — and more — in a Universal Windows app, but they’ve been promising that since the days of Windows 8. But if you find that there’s a OneDrive app on your computer, it might be worthwhile to try it and see if Microsoft’s gotten anywhere close. Good luck. By far the most options and the best controls for OneDrive are on the web. The option used most? Sharing. 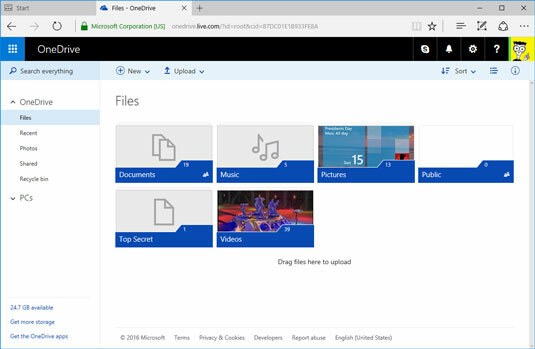 It’s true that you can right-click a file or folder inside File Explorer — and choose Share a OneDrive Link (which pops out to the web, retrieves a link, and copies it into your clipboard), or More OneDrive sharing (which also pops you into the web-based version of OneDrive, sometimes). Kinda cheating, but it works. Go to Microsoft OneDrive with your favorite browser, and sign in with your Microsoft account. 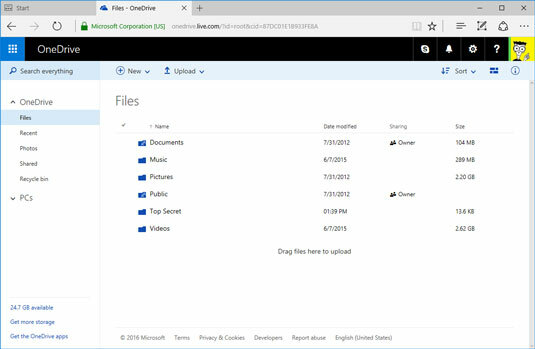 Your OneDrive data appears as big boxy tiles on a web page, as shown. All of your OneDrive account. To make the whole thing more accessible, at least with a mouse and keyboard, click or tap the Details View icon in the upper-right corner, immediately to the right of the Sort icon. Details view appears. If you have a mouse, details view is the easiest way to work with OneDrive. Find the file or folder you want to share, hover your mouse cursor over it, and select the box to the left of its name or in the upper-right corner of the picture. Selecting the box is important. Don’t click the file. If you click the file, you’ll probably open it — not the end of the world, but it’s easier to share without opening. If the file or folder is already shared, the word Owner appears in the Sharing column. With the box in front of the file or folder selected (or the upper-right corner of the picture selected), right-click the file and choose Share, or tap or click the Share link. OneDrive allows you to either grab a link that will let other people into your file or create an email that includes the link. The Share screen appears, as shown. 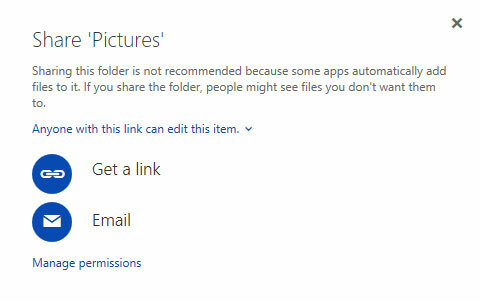 You can email a link to others so that they can see a file in your OneDrive folder. To allow people with a link to edit your files, choose Anyone with This Link Can Edit This Item. To allow folks to only view and not change the item, click the down wedgie and deselect the Allow Editing box. If you want to send a message to someone and put the link to the shared file or folder in the message: Click the Email icon. Fill out the screen by typing one or more email addresses in the box on top and adding whatever note you like. Tap or click Share. If you don’t want to send an email or you don’t want to share the file or folder with specific email addresses: Tap or click the Get a Link option on the left. If you choose to get a link, make sure you copy the link provided by OneDrive. You can use the link any way you want. OneDrive has many more capabilities. See the tutorial for an overview.